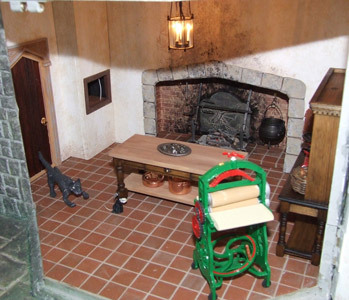 Here are some pictures of my own dolls house - a work in slow progress, but with some recent updates. 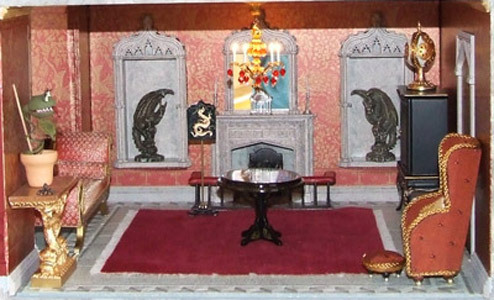 The house was built by Anglesey Dolls Houses (now sadly no longer trading) and is being given a Gothic theme. 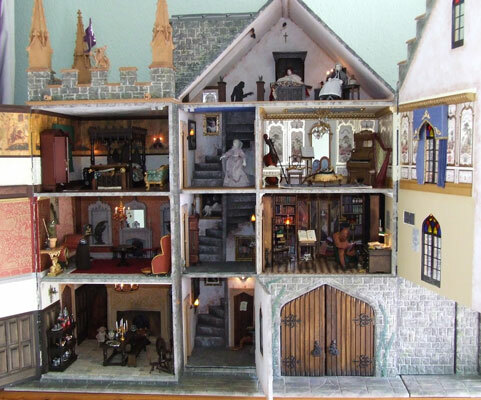 The plan is that eventually it will hold just about every cliche in the Horror / Fantasy genre you can think of, but so far has only a few dolls in it who tend to come and go as needed for other people's dolls houses. 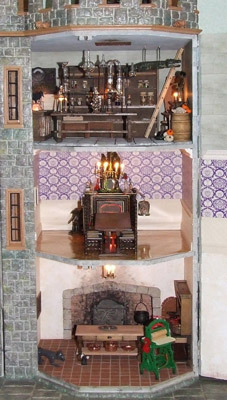 The Great Hall - Fireplace by Farthingale; Furniture by Tudor Time Miniatures, Michael Mortimer (9), and Masters Miniatures; Flooring by Richard Stacey; Chandelier by Grandad's Playroom; Dragon's head by Four Seasons Miniatures; Toys by St. Leger; Suit of armour from Jennifers of Walsall; Wall panelling from Anglesey Dollshouses; 'Dobby' by Miss Sally World, Spinning wheel by S & S Eismont. 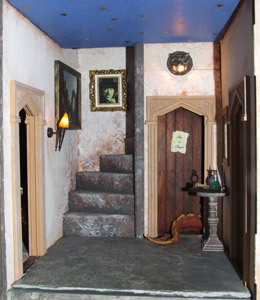 The Salon - Chaise by Perri's Miniatures; Round table with bespoke dragon painted on top from De Minilaars. Chandelier by Rosel's Chandeliers USA; Monster plant by 'Out of Africa'; Magical Cabinet by Four Seasons; Dragons in niches from TeePee; Console table by John Hodgson; Wing chair and footstool by Diane James; Plasterwork by Sue Cooke. 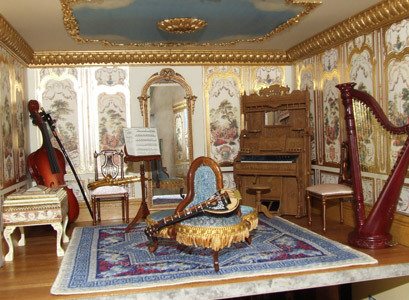 Music room - Parlour organ by Chrysnbon; Opera seat by Masters Miniatures. 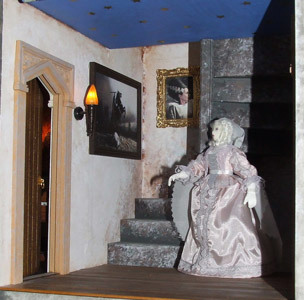 The cream chest is a music box that plays the theme from 'Phantom of the Opera'. The carpet has been my first (and last) foray into counted-thread work. Enjoyable, but hard on the eyes. Stairs - Top to bottom from left. The ghost seems to have made herself at home and refuses to leave. Some 'interesting' pictures are now appearing on the walls. Grandfather clock from Glenowen. 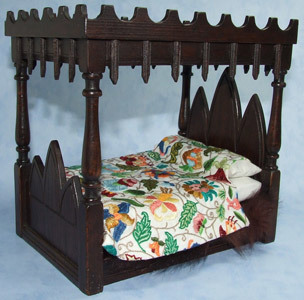 Above - Bedchamber - Now occupied by a Wolfman, vainly trying to shave away the excess hair! I had always intended to put a bogeyman hiding on top of the bed, but now realise that I have no idea what he would look like - because he is always hiding. 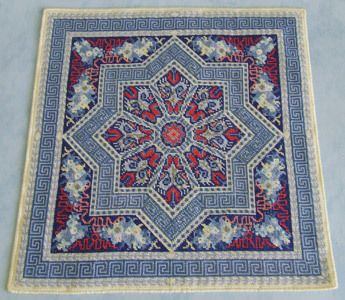 Bed with coverlet embroidered by me. 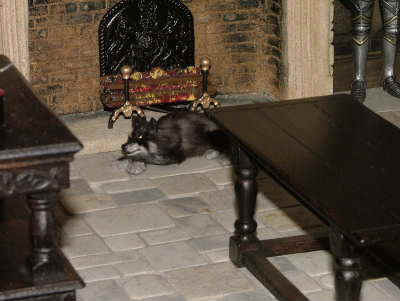 Notice fur coats and snow escaping from the wardrobe. Wonder where that's from? 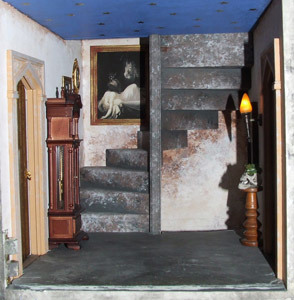 Bed and chest by Michael Mortimer (9), Sofa with mice by Four Seasons Miniatures. 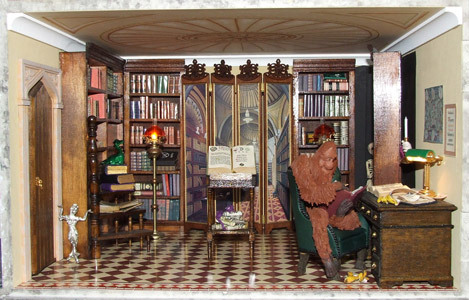 Library - Now fully stocked with books, but the Wizard previously shown has left the premises. Skeleton and Librarian by Four Seasons Miniatures (if you read Terry Pratchett you'll know why the librarian is an orangutan; Screen by Brooke Tucker. 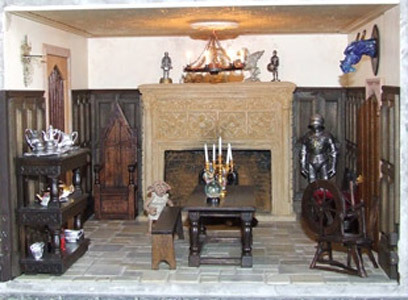 Attic - Furniture by Tudor Time Miniatures; Creatures by Four Seasons Miniatures. 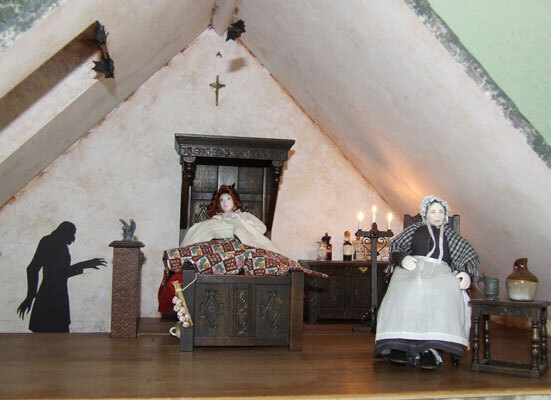 The poor mad woman in bed is the first doll I have made for this house that will be staying. She is just for me, unlike the sleeping nurse, who may leave for a new post if required. Tower - I have finally made progress with the tower extension. 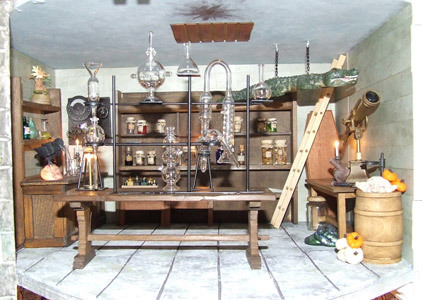 Kitchen - Dresser and table by Country Contrast, cooking equipment by The Village Wheelwright, Lantern by Wood 'n' Wool, 'Greebo' and 'Death-of-Rats' (Pratchett again) by Four Seasons Miniatures. The exterior walls were first painted with a solution of PVA glue and water, then coated with Polyfilla, spread on in patches about 1/8th inch thick, then marked into stone shapes with an artist's palette knife before it set. When all was covered, I added many coats of paint before I was happy with the colours. Base coat was light grey emulsion, with further coats of dark grey, beige, brown, green, yellow, white and more light grey acrylic paint sponged on. This all took many weeks. Finally it was given two coats of matt varnish. The walls of the stairs and attic were painted in a similar way - base coat of cream, then sponged with browns, greys and white. 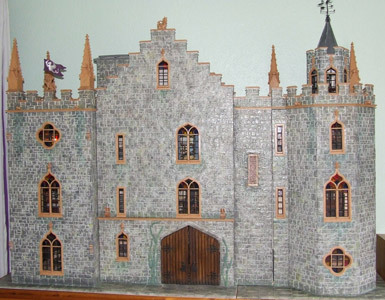 The sloped part of the roof is covered in tiles cut from cereal card, painted and sponged. The flat roofs and turret are covered with real lead strip from the builders merchant, stuck on with double sided tape.